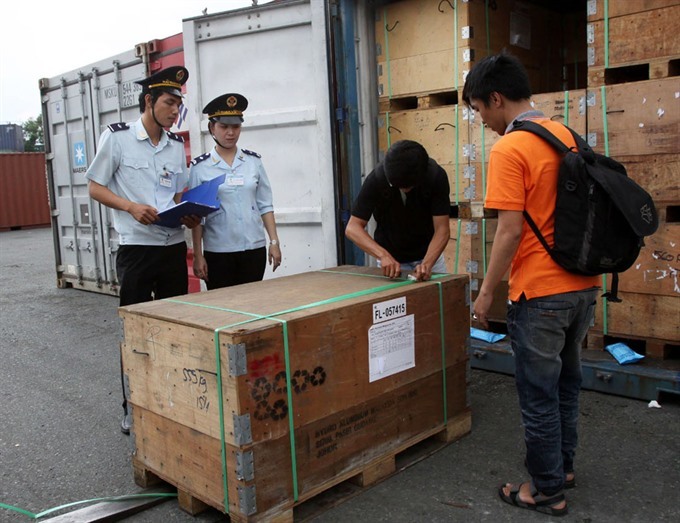 HÀ NỘI — The General Department of Customs has ordered the management of origin and labels of imported products to be enhanced. The move comes in the wake of a probe into Khaisilk’s trade fraud of selling "Made-in-China" products under the Vietnamese brand, which caused a stir. Accordingly, customs departments across the country must enhance their management of product origin and labels following the Government’s Decree 19 on product origin, Decree 43 on labeling and Ministry of Finance’s Circular 38 on customs management procedures. Special attention must be paid to Vietnamese companies’ products that were produced abroad and then imported into the country. All violations must be reported to the General Department of Customs. According to current regulations, organisations and individuals placing goods in circulation must be in charge of labeling, and the labels must provide clear and accurate product information. Hoàng Khải, chairman of the group which is considered a top Vietnamese silk brand, later admitted that the scarves were actually imported from China. On Saturday (November 4), Deputy Prime Minister Trương Hòa Bình asked the Ministry of Industry and Trade in coordination with relevant ministries to clarify violations of Khaisilk and report the findings before December 15. Customs’ statistics showed that imports of silk products from China were worth US$1.2 million in the first nine months of this year, while the figures were $2.3 million in 2016 and $4 million in 2015. From 2015 to September 2017, Việt Nam imported more than 8,800 silk scarves from China, worth some $35,800. In another development, the Hà Nội Department of Taxation recently reported on the tax payments of Khaisilk’s store on Hàng Gai Street. Accordingly, the store, which is owned by Nguyễn Thu Nga and began selling silk products from January 2004, earned revenue of VNĐ14 billion in the January-September period and paid tax of more than VNĐ200 million for the period. The company earned VNĐ15.6 billion in 2015 and VNĐ16.11 billion in 2016 as revenue, and paid taxes worth VNĐ234 million and VNĐ241 million, respectively. The tax department said that the store was not in arrears of taxes.